(NAN)Usmanu Danfodiyo University, Sokoto has named Katsina state born Zainab Abdullahi as its first female student to bag first class in physics. 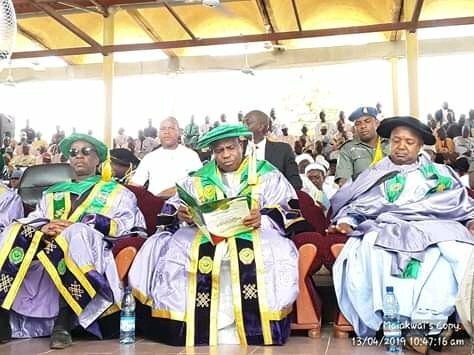 The Vice-Chancellor, Prof. Abdullahi Zuru, also said 12, out of which 135 were Ph.D. holders, 770 Masters degrees and 10,034 obtained first degrees among others. Zuru explained that the university, within the period, established modern urology center, new faculty of agriculture and modern communication support center, among others. He urged the management of universities to evolve measures to improve the welfare of their staff and students. He further thanked Nigerians for renewing his mandate and giving his party, the All Progressives Congress (APC), the majority in the National Assembly and assured that he would continue with the good works started and improve on them. They are business Mogul Aliko Dangote; Emir of Gwandu, Alhaji Iliyasu Bashar; and Sheikh Mujtaba Isa-Talatan Mafara. The beneficiaries were Dr. Zayyanu Abdullahi, the Emir of Yauri in Kebbi state as Chancellor Emeritus and Prof. Tijjani Bande, the Permanent Representative to the United Nation as Professor Emeritus.